Ischebeck Titan anchor piles can be used wherever a traditional ground anchor is being considered and provide a fast, efficient method of installing tie back anchors in a single visit to the drill hole. The installation technique allows the anchor pile to be drilled, installed and grouted at the same time, offering benefits to ground improvement, type of machinery used for installation and dramatically increasing the productivity on site. 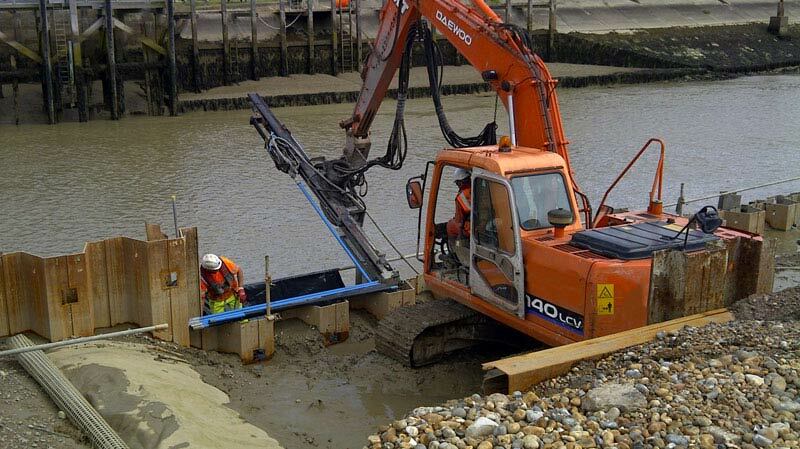 Our system is one of the most versatile and effective ground engineering solutions available to engineers. Ischebeck Titan injection Tie Back anchors can be designed to meet a 120 year service life. This is based on the systems steel characteristics, allowances for sacrificial loss of cross section, the benefits of cement grout cover and crack width limitation within the grout cover. Using these means of corrosion protection, Ischebeck Titan permanent tie back anchors have been installed on schemes for clients that include, the Highways England, Network Rail, Environment Agency, Canal & River Trust (formerly British Wateways), London Underground and Local Authorities. An effective method of progressing the excavation, clearance and construction of a site, is to maximise the space available. Traditional methods of internal propping and shoring occupy a significant proportion of a construction site’s area, limiting space, restricting movement of plant and ultimately impacting on the programme. Given the necessary approvals, tie back anchors can be installed beneath highways temporarily. Utilities, once identified, can be avoided by increasing the tie back anchors angle of installation. The use of temporary works tie back anchors to retain structures eliminates the need for temporary propping or shoring, freeing up space on site. This enables the groundworks and construction to progress efficiently. Up to 3 times greater productivity than conventional cased anchor systems. No casing is required in collapsing ground conditions. embrittlement or stress corrosion cracking. The grout body and controlled crack widths provide permanent corrosion protection. Very low creep characteristics of the bar eliminate the need for restressing.